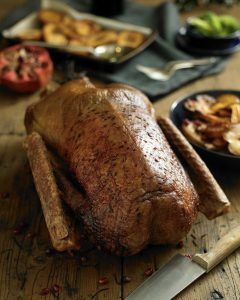 Roast Goose is such a wonderfully rich and tasty meat, when cooked well, it’s such a treat! Follow our easy guide on how to cook your Christmas Goose to golden and crisp perfection. Leave the goose out of the fridge for an hour before cooking to let it reach room temperature. Season the Goose with the salt and pepper and place into a deep roasting tray, drizzling over a little olive oil. You can tell if the goose is cooked to perfection if the the leg meat easily comes away from the bone. Cover with foil and a clean tea towel and leave to rest for at least 30 minutes. Remove the Goose from the roasting tray and place on a board for carving. be sure to make use of all the delicious rendered fat and pour it into a clean jar, leave to cool and place in the fridge, ready to use another day or drizzle on your potatoes for the best ever crispy roast potatoes!